Up to 60% Off Bride's Favorites! This week's sale at The Knot Wedding Shop offers up to 60% off our bride's favorite products! 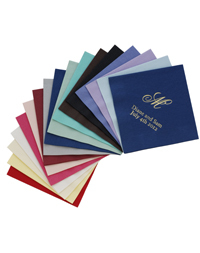 Check out the best-selling Personalized Beverage Napkins, now only $17.99/100 (was $$26.95). One happy bride told us "These napkins couldn't be more perfect!" See what's On Sale at The Knot Wedding Shop this week find great deals on ALL matches, cameras, and cake toppers this week, too. Hurry, the Valentine's Day 10% off coupon expires February 14th! Just use promo code HEART at checkout. Sale runs from Wednesday, February 11th to Tuesday, February 17th.